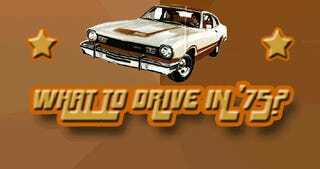 What To Drive In '75: Oleg Cassini Matador or Grabber Maverick? Say you've been time-traveled back to 1975. Your wardrobe of rayon leisure suit, mood ring, and gold-razor-blade medallion has been arranged for you, as has your stash of Acapulco Gold and Rorer 714s, and you have only to buy your wheels in order to be ready to score with the foxes at the Peter Frampton show... which starts in an hour. You have been issued the inflation-adjusted equivalent of the money needed to buy a mid-level present-day car, in 1975 dollars; now take this book and pick out your vehicle and options, staying under that price (we'll assume the dealership has every imaginable combination of model and options sitting on the lot). Well, what's it gonna be? Hilarity always ensued once the participants got a good look at their choices. Did you want a big-block V8 wheezing out 140 horses? Could you get a 4-speed with it? It goes without saying that you must have the 8-track player. And so on. Back in the Malaise Era, American automakers figured they could make buyers forget about the lackluster performance and ugly crash bumpers on their cars by applying the special styling touch of famous fashion designers to their cars. Ford got inflatable-tank designer Bill Blass for their team, so AMC counterpunched by hiring Oleg Cassini and Pierre Cardin. And that leads us to Choice #1 in today's poll: the 1975 Oleg Cassini Matador! Ford didn't offer a designer edition Maverick in '75 (you had to go for an LTD or Continental for the touch of Bill Blass), but their anonymous in-house stylists did a fine job with the Grabber package. You got all manner of emblems and tape stripes, not to mention a super-cool hood. Yes, in the real world you'd probably skip the factory stereo and go with aftermarket audio gear (perhaps a nice Sparkomatic rig? ), and you'd want to do a quick cam/intake/carb/headers upgrade on the engine. But let's say you're heading straight for the Frampton concert from the AMC or Ford dealership and need your car fully equipped today! In 2007 dollars, the prices of these two cars come to just under $17,000 (admittedly, I'm using base prices instead of MSRP, but with dealerships desperate to move iron off their lots during a period of recession, you should have been able to sweat the salesman down to base price anyway). Can you get anything as cool as an Oleg Cassini Matador or Grabber Maverick for Ford Focus money these days? Does the Focus have a little-known Grabber option package? Come on, Ford, give us a Grabber Focus! Stay tuned for the next What To Drive In '75 episode, in which you'll get to vote on a couple of imports!